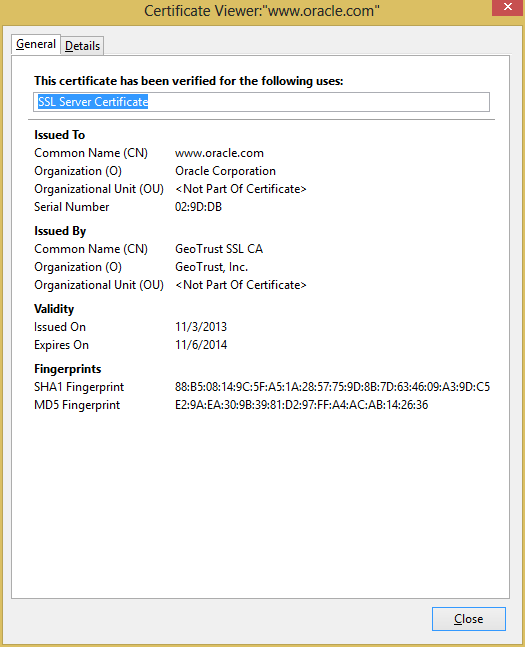 So far we have established that using TLS/SSL with Oracle XE is not violating any Oracle licensing issue. We just have to find a way to create the wallet to be used by Oracle XE. Of course you can run Oracle Wallet Manager from a non-XE Oracle installation somewhere, and transfer the wallet to your Oracle XE installation. But what if you do not have access to any properly licensed installation of Oracle? Oracle Wallet Manager stores X.509 certificates and private keys in PKCS #12 format, and generates certificate requests according to the PKCS #10 specification. These capabilities make the Oracle wallet structure interoperable with supported third-party PKI applications and provide wallet portability across operating systems. Therefore, we can use OpenSSL to create a PKCS #12 archive and it should work with Oracle XE. In Oracle terminology, a wallet is a directory containing a file named ewallet.p12. Therefore, the PKCS #12 file must be named as such. In this example I will use the Oracle Support web page as the target page. 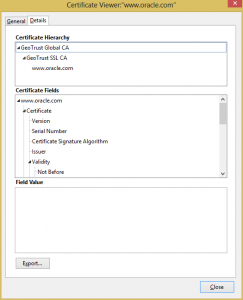 First, grab the certificate and all the certificates in its chain by using a browser. In Firefox, this is done by clicking the padlock icon in the address bar, then clicking on ‘More Information…’. 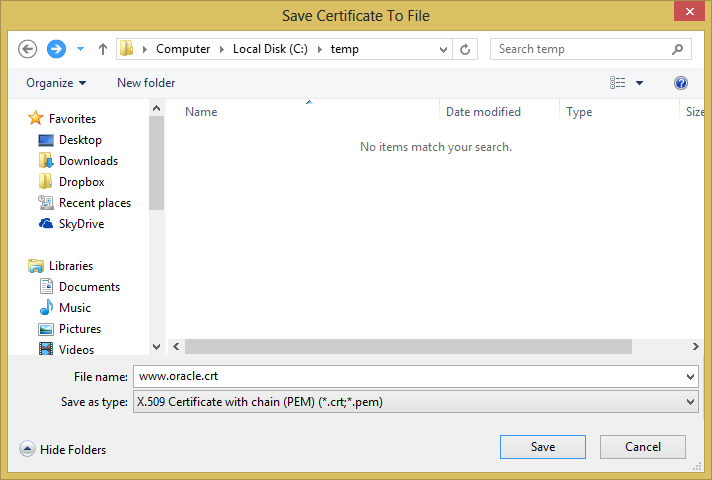 Select the certificate at the bottom of the chain (www.oracle.com) and click ‘Export…’. 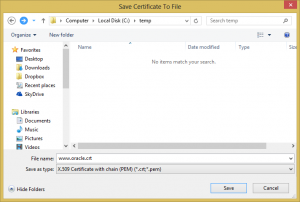 Change the ‘Save as type’ to ‘X.509 Certificate with chain (PEM)’ and save the certificates to a file. Transfer this file (mine is named www.oracle.crt) to your Oracle XE server where you want your wallet to be (I chose /u01/app/oracle/wallet). Now use OpenSSL’s pkcs12 command to create the wallet file using the certificate file as input. Use the -export flag to create a PKCS #12 file instead of reading one, and use the -nokeys flag to indicate that a private key does not exist inside the input file. Enter a suitable password when prompted. This password will have to be provided when using UTL_HTTP later. I tried many times from scratch and even created a wallet from a non-xe version and it also throws the same error. Any ideas? I have come across this myself a few times. Unfortunately, it seems to me that the wallet sometimes does not play nice with certain certificates. I have not yet able to identify the root cause. I found the cause. 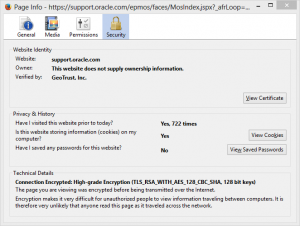 Oracle up to 11.2.0.2 (which Oracle XE is) doesn’t support SHA-2 based certificates. In non-XE version the solution is to apply patch or upgrade to the latest version but unfortunately with XE it is not an option. I therefore set up Apache Reverse Proxy pointing to https traffic and then called Apache server in https from Oracle. In this case you don’t need a wallet anymore. Hi, I would like to use the Apache Reverse Proxy solution to eliminate the wallet. Can you explain me how you achieved this? Hello, Could you please share setting up the reverse proxy with us? To use the Apache Reverse Proxy first install Apache. If you want to access https://api.paypal.com with UTL_HTTP you need to create something like following in httpd.conf (Apache configuration file). You can also using nginx as the reverse proxy. The reverse proxy solution works perfect! And forget about the wallet. Excelent! it works like hell!!! so how can i solve this ? The workaround is the Proxypass example given above. But is there any way to do it with only oracle wallet ? So I understand, we need to grab = certificate + all the certificates. So, the question is: How many certs we have to grab and how many files to create for further final step with openssl command? If many, should we combine the grabbed certs to the single file? Please, explain! ORA-29106: Cannot import PKCS #12 wallet. *Cause: The UTL_HTTP package failed to execute the HTTP request. *Action: Use get_detailed_sqlerrm to check the detailed error message. Fix the error and retry the HTTP request. 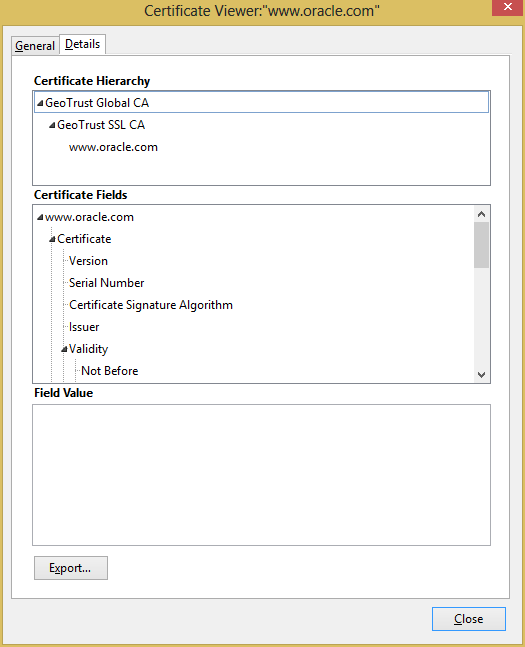 In your example of connecting to https://www.oracle.com, you say to export the “bottom” server certificate and import/add it into the wallet. This is wrong, you should not add the site’s server certificate to a truststore. 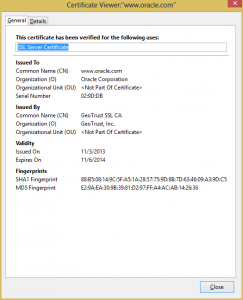 When creating a truststore you should only add the root CA certificate, i.e. the “top” one “GeoTrust Global CA”. and i am able to create ewallet.p12 file using openssl but still database is keep throwing Certificate validation failure when call https url.